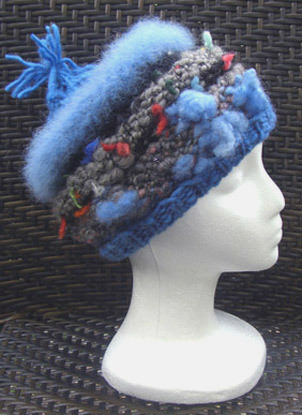 This is a new style that's a variation on my lumpy knit cap that often has a bobble of some sort on top. The first one I made was red, gray and black and has now been sold. It took me about two weeks to figure out how I had made it. This one is similar in design, and I think it came out just as well. It has a bit of a peaked top with a tassel. It's also got an interesting combination of yarns. 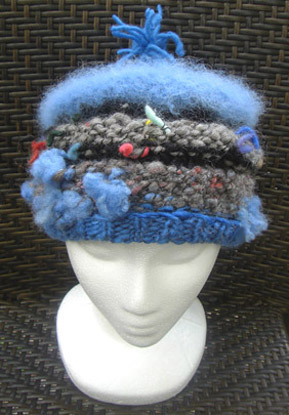 The fuzzy looking blue section near the top is dyed Samoyed hair. 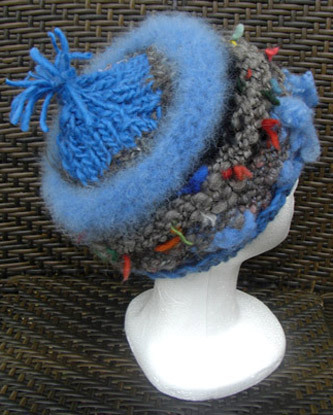 The blue brim and top section, as well as the solid black sections are Corriedale wool. The lumpy gray section in the middle is undyed English Shetland wool with bits of colored yarns plied in. The bottom section is more of the same Shetland blended with bits of red wool and a hint of sparkly angelina, and with big clumps of unspun blue Romney wool plied in. 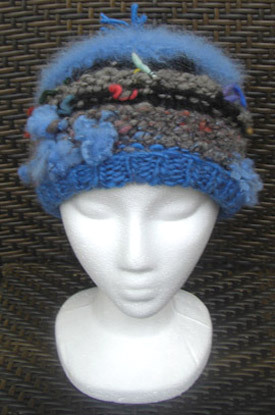 There is also a border of gray mohair between the top section and the Samoyed hair. Since this is my latest style, it's also my favorite!